instruNet hardware supports the measurement of Bending or Twisting (Axial) strain; and also supports ¼, ½, and Full Bridge devices. To set up one of these configurations, please click on one of the below options. 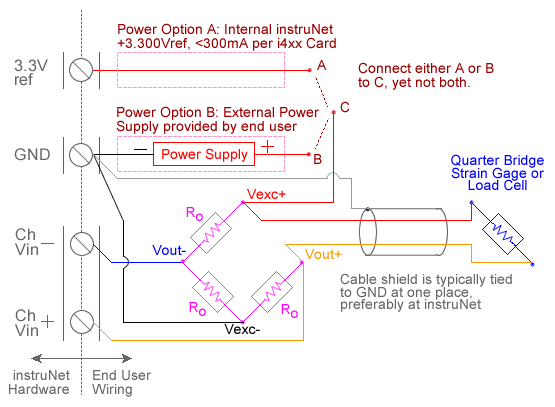 The below wiring diagram shows how to interface a quarter (¼) bridge strain gage to an i512 Wiring Box. For details, click here. RGAGE, RLEAD, GF, VINIT and VOUT are fixed values that are specified by the user in the Constants Settings area, whereas (Vin+ - Vin-) are measured in realtime by instruNet. Ro and Unstrained-RGAGE must be the same value (e.g. 350ohms) in order for the bridge to operate properly 4. For more details, please see Maximizing Strain Gage Accuracy, Load Cells, Shunt Resistors, 10V External vs. 3.3V Internal Excitation and Voltage Ratio Measurements. 1. Set the Sensor field in the Hardware settings area to Strain Gage. 5. 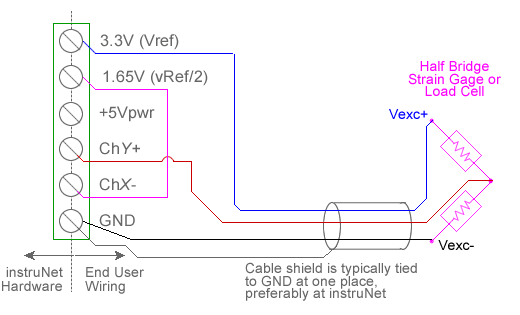 If working with hardware that has variable internal excitation (e.g. i100 ± 5V), then set the Vout field in the Constants settings area to the desired excitation voltage 2, 11. Alternatively, if applying an external excitation voltage, enter -RGAGE value in the Ro edit field (e.g. -350 instead of 350 ohms) to tell the software that the excitation is external, and then enter the external excitation voltage in the Vout field. For more information on excitation, see 10V External vs. 3.3V Internal. 6. Set the delta, Rlead field in the Constants settings area to the resistance, in ohms, of the wires leading to the bridge (0 ohms is typically ok). 8. Set the Wiring field in the Hardware settings area to Quarter Bridge. 9. 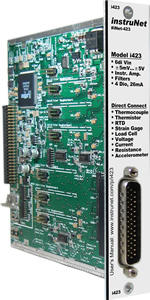 Capacitors across the voltage input terminals are highly recommended with the i100 (not with the i420/i430/i60x 12) for reducing errors caused by RFI. With 350ohm gages, 0.1uF caps create a low pass filter at 4KHz [4K = 1 / (6.28 * 350 * 0.1e-6)], and are ideal at minimizing RFI effects. 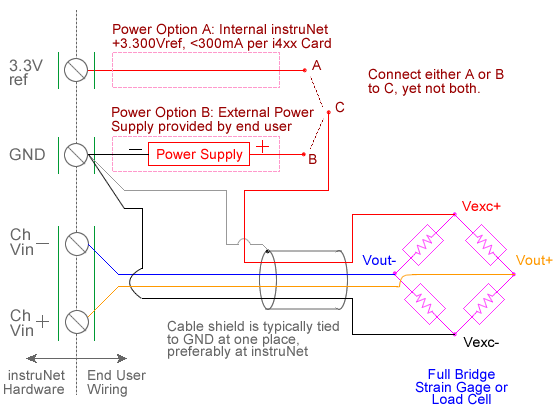 The below diagram shows how to wire an i512 Wiring Box to a half (½) bridge strain gage. For details, click here. 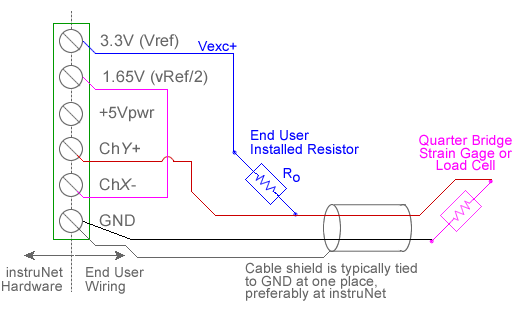 RGAGE, RLEAD, GF, VINIT and VOUT are fixed values that are specified by the user in the Constants Settings area, whereas (Vin+ - Vin-) are measured in realtime by instruNet. Ro and Unstrained-RGAGE must be the same value (e.g. 350ohms) in order for the bridge to operate properly 4. 1. Do steps #0 through #7 listed in the previous "Strain Gage Measurement - ¼ Bridge" discussion. 2. Set the Wiring field in the Hardware settings area to Half Bridge Bending. v (Poisson), RGAGE, RLEAD, GF, VINIT and VOUT are fixed values that are specified by the user in the Constants Settings area, whereas (Vin+ - Vin-) are measured in realtime by instruNet. Ro and Unstrained-RGAGE must be the same value (e.g. 350ohms) in order for the bridge to operate properly 4. 1. 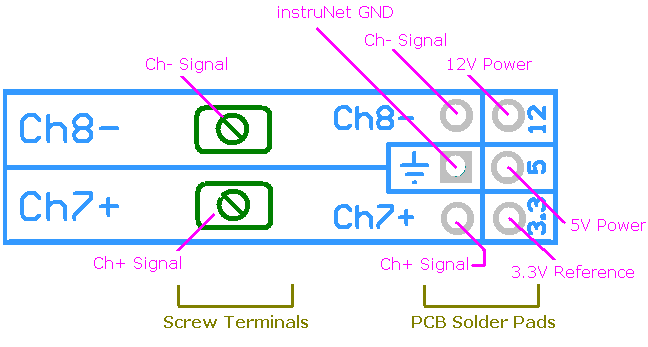 Do steps #0 through #7 listed in the previous "Strain Gage Measurement - ¼ Bridge" discussion. 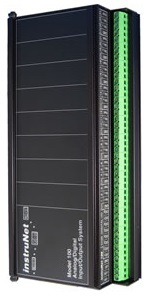 For details on how to interface to an i512 Wiring Box, click here. 2. 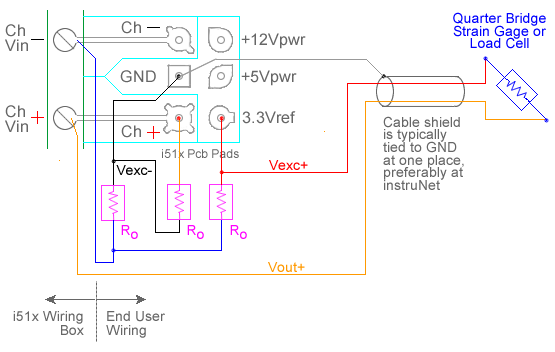 Set the Wiring field in the Hardware settings area to Half Bridge Axial. 3. Set the v_Poisson field in the Constants settings area to the poissson value of the material that you are twisting (e.g. aluminum is 0.32). GF, VINIT and VOUT are fixed values that are specified by the user in the Constants Settings area, whereas (Vin+ - Vin-) are measured in realtime by instruNet. 2. Set the Wiring field in the Hardware settings area to Full Bridge Bend. v (Poisson), GF, VINIT and VOUT are fixed values that are specified by the user in the Constants Settings area, whereas (Vin+ - Vin-) are measured in realtime by instruNet. 2. Set the Wiring field in the Hardware settings area to Full Bridge Axial I. 3. Set the v_Poisson field in the Constants settings area to the poisson value of the material that your are twisting (e.g. aluminum is 0.32). 1. Do steps #0 through #6 listed in the previous "Strain Gage Measurement - ¼ Bridge" discussion. 2. Set the Wiring field in the Hardware settings area to Full Bridge Axial II.